Dunbar and Boardman: Who Built the Largest Spiral Escalator in the World? When is an everyday object no longer an everyday object? We don’t normally start of our blog with a puzzle but this question applies to escalators. In the developed world linear escalators are now commonplace. We are used to seeing them in department stores, at airports and train stations. Turn that linear escalator into a spiral escalator and it is no longer commonplace. 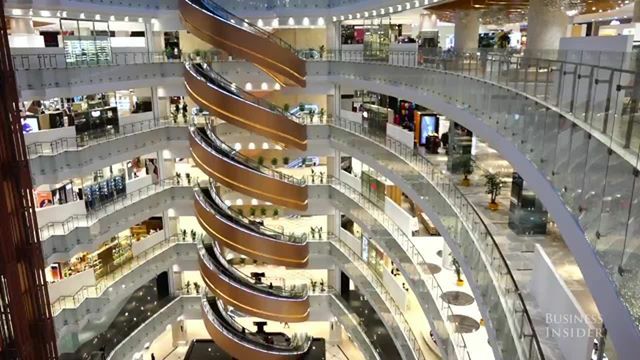 Spiral escalators are still quite rare and are a fascination not only for engineers but also for the general public wherever they appear around the world. In March 2015 Mitsubishi completed the construction of the largest spiral escalator in the world in Shanghai, China. Twelve curved escalators form the spiral. It is not a continuous spiral but it is still a very impressive feat of engineering assembled at the New World Daimaru Department Store. The cost of the spiral escalators has not been made public but it is safe to say that spiral escalators are the Bugatti Veyron of the escalator world. Mitsubishi Electric built the spiral escalators at the New World Diamaru Department Store. The company first developed the spiral escalator in 1985 and since then has remained the world’s only manufacturer of spiral escalators. There are earlier incarnations of curved escalators and you can read about the first one here. There are two clear reasons why other manufacturers have not followed them. First of all spiral escalators are difficult to construct and must be made up on site and secondly, they are very expensive and are not a mainstream product. Mitsubishi have built 103 spiral escalators in Japan and around the world. There is an example at Caesars Palace Forum Shops in Las Vegas. Spiral escalators are usually deployed in luxury environments and there are further examples at the following locations: San Francisco Centre, San Francisco, Canada’s River Rock Casino Resort, Wheelock Place in Singapore, Saudi Arabia’s Jeddah Hilton, The Landmark Tower in Japan, the Times Square shopping mall in Hong Kong, Lotte World in South Korea, The Venetian Hotel and Casino in Macau, Wynn Las Vegas. What are the benefits of a spiral escalator? Spiral escalators can take up less space than conventional escalators but this consideration must be weighed against the fact that they are more complicated to install and a lot more expensive. From the point of view of the mall, hotel or casino having the spiral escalator installed; spiral escalators will put your venue on the map. The spiral escalator at the New World Daimaru Department Store has become a tourist attraction. Visitor numbers at the department store remain at very high levels largely because of the free publicity generated by the world’s largest spiral escalator. Do you have any actual cost figures? Your post improves my knowledge about largest spiral escalator in the world. Dr Andrew Unterweger is a specialist person in this field. If you have any problem, you can contact with him.